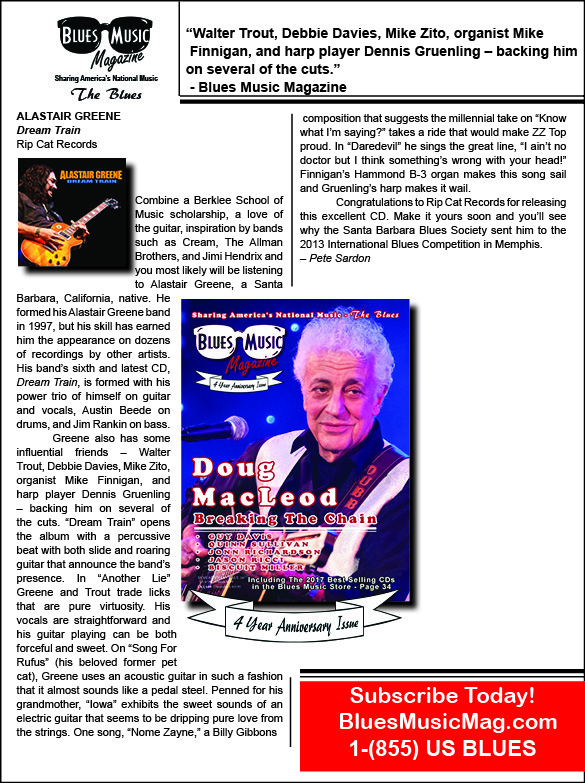 'Dream Train' is the latest release from Blues rocking guitarist, singer, and songwriter, Alastair Greene. Greene recently left the Alan Parsons Live Project (with whom he played lead guitar and toured the world for 7 years) to focus on his solo career. 'Dream Train' is packed with 13 genre defining songs ranging from all out rocking Blues, to more traditional offerings in addition to songs that could easily fall into the Southern Rock / Jam Band format. The lone cover song, 'Nome Zayne', is a previously unreleased song written by Billy Gibbons of ZZ Top, all other songs were written by Greene. 'Dream Train' was produced by David Z and features guests Walter Trout, Debbie Davies, Mike Finnigan, Mike Zito, and Dennis Gruenling.